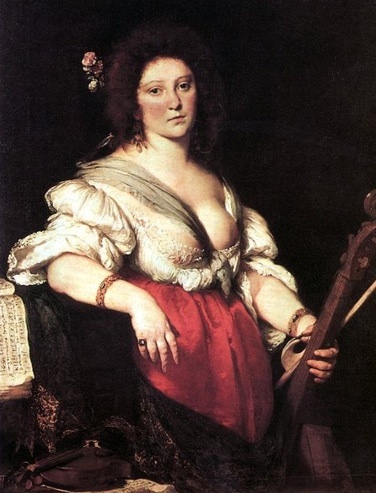 Barbara Strozzi (1619-77), was born in Venice and worked most of her life in the city. She was the illegitimate daughter of the poet Giulio Strozzi, who adopted her and encouraged her precocious talent for singing and music, sending her to study under Francesco Cavalli. She played many instruments, and was renowned as a soprano, performing at the Academy of the Unisons which her father founded to showcase her talent. Her father contributed the lyrics to her first volume of madrigals, published in 1644 with the note that it was 'the first work that I, as a woman, all too daringly bring to the light of day.' She would go on to publish eight further collections of cantatas, madrigals, ariettas and duets, many with her own often passionate lyrics. Some three quarters are written for the lyric soprano. Little is known of her personal life. Because of the deshabille of her one reputed portrait, some have presumed she was a courtesan. What is certain is that she had four children, three by her married lover Giovanni Paolo Vidman. Her last known songs were written in 1665 for Carlo III, the Duke of Mantua. Twelve years later she died in Padua.